11/07/2016 - Unprecedented accuracy in long range El Niño forecasting has been achieved by a quantum gravity algorithm. 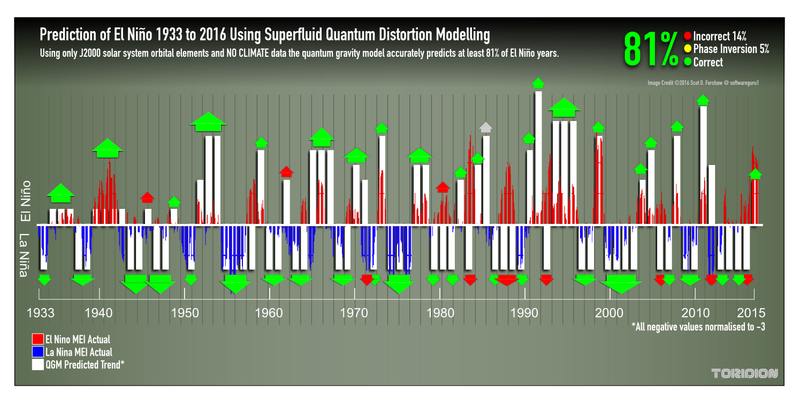 Whereas existing methods fail to provide reliable long range forecasts past 6-12 months, the breakthrough results achieved by Quantum Gravity Modelling 'QGM' predicted 81% of events over a period of 84 years without using any pre existing climate information. Instead of using past climate, temperature and wind data, the method relies solely on the predicted interactions of gravity and tidal stress between the planets of the solar system and our Sun. To guess the correct trend of the complex pattern of El Niño 'first time' over the 84 year period would have odds in the “trillions and trillions to one against” and the research demonstrates with clarity that Earth is part of a much bigger interplanetary space weather system which has the ability to affect our climate. El Niño can have disastrous consequences for agriculture and it is hoped this long range forecast method will one day be able to give planning bodies in developing nations much more time to consider how to prepare for them. A new method of predicting El Niño has outperformed even the most sophisticated super computer driven climate models by demonstrating the ability to indicate future El Nino trends with significant 81% accuracy over a period of 84 years. The software, which was designed by Toridion Project's Scot D. Forshaw uses no climate data at all, rather it predicts microscopic fluctuations in “space time” and gravity caused by the interaction of the planets of the solar system and the Sun. Forshaw suggests that everything is connected in our quantum universe and the results from the model do nothing to detract from that postulate. Our solar system functions as a single composite “stable particle” in which the planets which orbit the Sun can be seen as elements in the covalent bonds between galaxies. “Everything is connected at the sub space level”. I am well aware that NASA, NOAA and almost every other officially funded climate body are not exactly advocates of planetary involvment in anything "terrestrial". These results suggest they should "look again". The applied method models the predicted distortions in space time caused as our solar system rotates around the Sun, the results are then plugged into a discriminator algorithm which relates the most significant distortions as YES or NO. 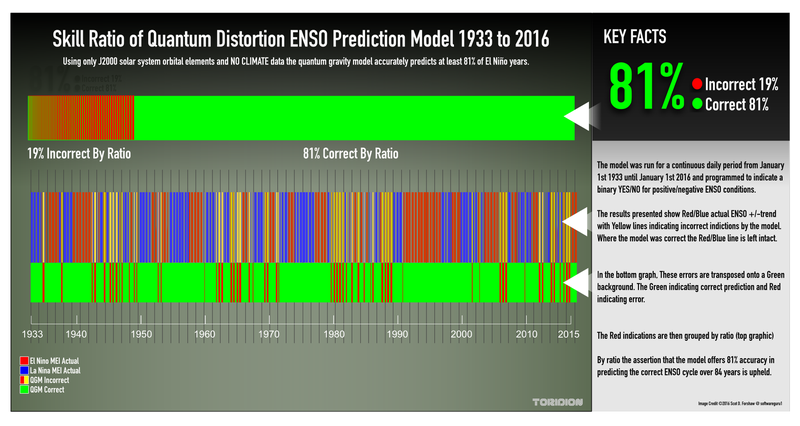 Over a continuous period of time from 1933 to 2017 the software predicted over 8 out of 10 years in which El Nino conditions were present to one degree or another. Taking each year as a single YES/NO option, the period becomes an 84 bit number or 2^84. Therefore, over an 84 year period the approximate number of possible combinations of YES/NO is a staggering 19,342,813,113,834,100,000,000,000. The probability that a computer model that contains no rules or data relating to past climate or terrestrial sea surface temperatures would be able to produce a trend that was over 81% correct is so low as to be practically incalculable. To solidify the results further it can be seen that the model was able to predict some very irregular events. For example during the period of 1990 to 1995 there was an unprecedented period of continuous El Niño followed by 2 years of La Nina and then another isolated El Niño. The model predicted this “once in 200 year pattern” with remarkable accuracy for a continuous 11 year period. Again, from 1965 to 1978 (14 years) the model was 100% on target. The image below shows the indicated trend in 1 year blocks over the actual recorded El Nino index in MEI format from 1933 to January 2016. The correlation is way beyond "coincidence". If this was any other field of study, you would be very happy to find such a close correlation over 84 years. Until some of the errors in the model can be fully accounted for future predictions are being kept to a cautious minimum, however the model is in agreement with most official predictions for 2016-2017 and is currently predicting that El Niño would end in early 2016 falling to La Niña until significant disturbances in July 2017 may disturb the downward trend. Despite the amazing accuracy of the general trend prediction, the model still has errors that require attention. The most encouraging thing is the predictable nature of the errors. Forshaw explains “when errors occur they do so on major temperature shift boundaries”. The model gets the shift in temperature time frame perfectly correct - “just in the wrong direction”. There is a great confidence that such a reliable error will be predictable and accounted for. Once that happens, the confidence of forecasts will increase to 90%+ levels for many years in advance. My mission now is to perfect this technology and make it available free to those who need it most. I have spent to long and come too far on this project and the results are such that it is within reach that a long range El Niño forecast algorithm seems possible. If developing nations had been able to access the information this research has revealed 50 years ago, without doubt lives could have been saved. Thanks is given to the many external researchers who contributed and helped make this result possible through many hours of testing and verification, discussion and suggestions.